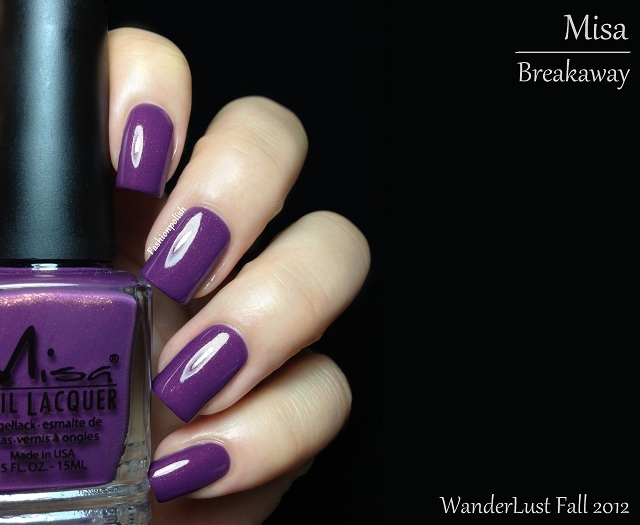 Fashion Polish: Misa WanderLust Fall 2012 Review and...another Giveaway! 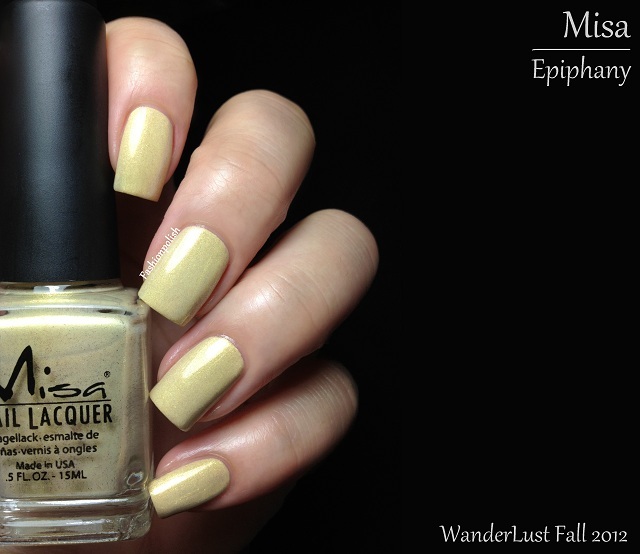 Misa WanderLust Fall 2012 Review and...another Giveaway! Misa has released one beautiful collection after the other this year and their Fall WanderLust is no exception with six amazing shimmers! Breakaway is a medium plum based infused with red and gold shimmers. 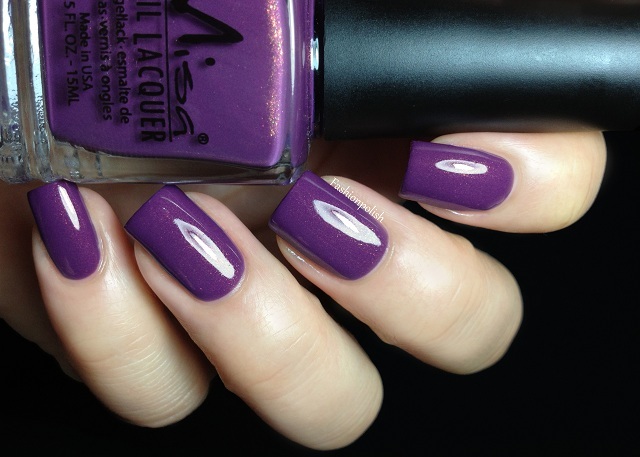 I absolutely love this kind of purples! The shimmer is subtle but definitely adds dimension to the base. It's very similar to OPI Dutch 'Ya Just Love OPI or Zoya True but I wouldn't call them dupes. This is two coats plus topcoat. Epiphany is a very light muted yellow packed with strong metallic gold shimmer. It's completely unique in my collection and although I wouldn't have thought of this kind of shade for Fall, it still works somehow. I also used 2 coats here but a third one might be necessary for full coverage if you're not carefull with application. Frozen in Time is a dusty lavender with a subtle pink shimmer running through. It's so stunning, I think could wear colors like this all the time! I love the contrast between the cool toned base and the warm saturated shimmer. You're looking at 2 coats plus topcoat. 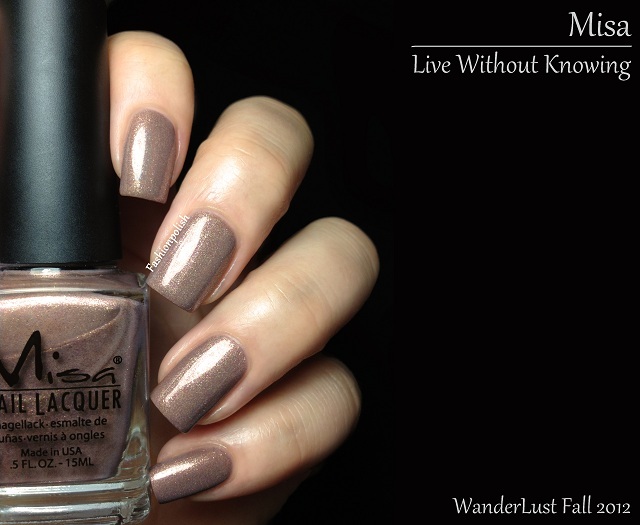 Live Without Knowing is a light cool taupe with tons of gold and pink metallic shimmers. 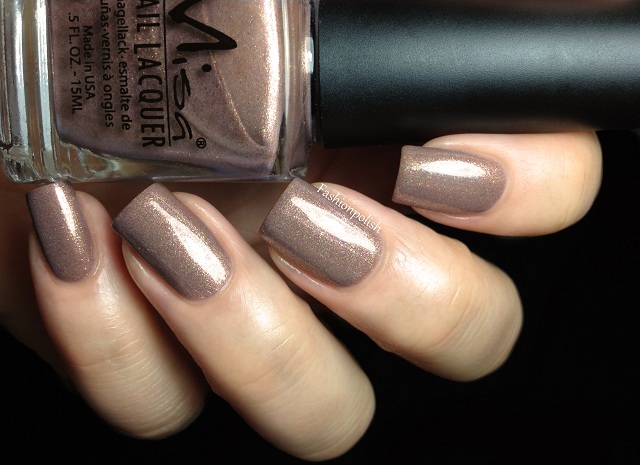 It's a very complex and sophisticated shade and I love how it's different from the usual taupes with gold shimmer. I used 2 coats and topcoat. Lost To The World is a warmer and darker taupe than Live Without Knowing with a subtle red, gold and green shimmer. 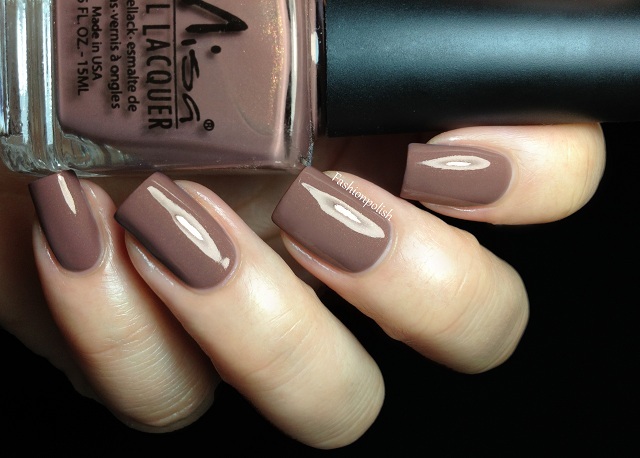 It's typically the type of brown that suits every skin tone. I love it! Again, this is two coats and topcoat. Taking Chances is a cool toned apricot packed with strong gold metallic shimmer. It's also completely unique in my collection and rather complimenting. Two coat plus topcoat here as well. Formula was really outstanding on all of these, on the thicker side but surprisingly easy to apply and very pigmented, even the yellow applied nicely and with no streak. I've been really impressed with Misa formula in general lately. The WanderLust collection is already available on misacosmetics.com and retails for $7.50 each. And now, your chance to win the complete WanderLust Fall 2012!!! The giveaway is open internationally to all those who are legal of age in their country until November 4th. This time, I really wanted to give a special thanks to my faithful "commenters" so you will get an extra entry if you've left a comment in the last 30 days (besides giveaway posts). You can also tweet about the giveaway for 1 extra entry. I will randomly pick the winner on November 5th and she (or he) will have 48 hours to reply. Thanks for the giveaway! These are gorgeous! Breakaway and Epiphany both look gorgeous! And I love the way you hold the nail polish bottles. Very pretty. I LOVE Live Without Knowing!!! LOOOOOVVVVEEEE!!!!! Sigh...I love them so much! I LOVE EPIPHANY. And Taking Chances. These are gorgeous! You make colors I wouldn't normally look at twice, like the yellow and the apricot, look so stunning, I want them all. Live Without Knowing is very pretty! I have to come to love my Misas over the last couple of months. Not only because they released some pretty exiting shades lately but because the whole concept is so convincing. Frozen in Time and Live without Knowing are my favorites out of this collection. 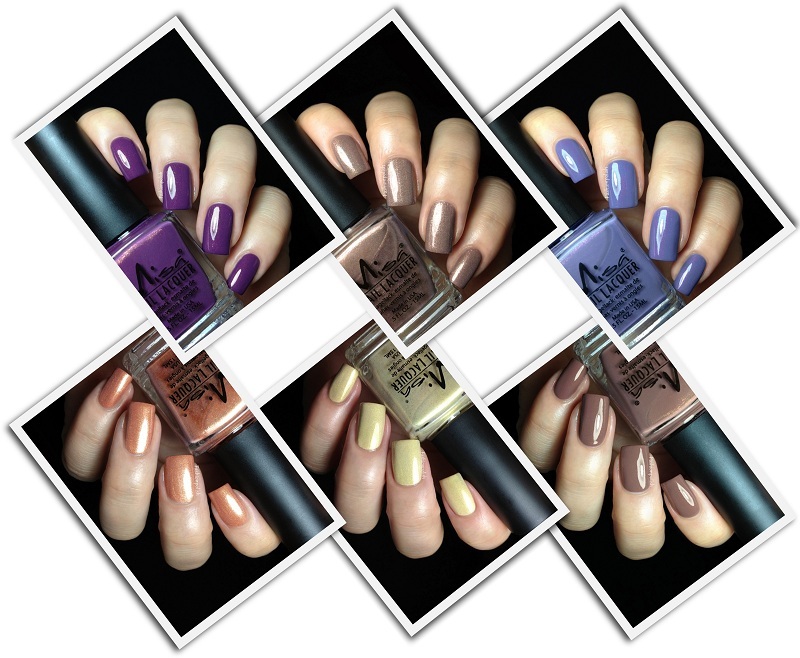 AND again swatches immaculates by you!!! Simply beautiful on you <3 Thank you for all the great Give-aways you launched recently for all of us!!! Frozen in time is beautiful, I think it's my favorite! Great collection overall!! Great giveaway! Love your swatches! This collection is love- especially Breakaway and Frozen in time- thx for the excellent swatches! I love every single color of this collection. I'm debating with myself if I should order them now or just wait a little longer. My absolute favorite is Live Without Knowing. what a pretty collection! I absolutely love Frozen in Time! the 1st purple is also pretty. Omg this collection is awesome! Thank you do much for the giveaway! Love your blog, especially your swatches. How do you make your polish so shiny? Frozen in time reminds me so must of Essies Smooth sailing! beautiful polishes, thank you fot the ga! I admit I couldn't wait and ordered 3 of them! These look SO beautiful. I wish they sold Misa where I live so I could try them out! Love your blog and love these colors!!! Breakaway reminds me A LOT of OPI Dutch Ya Just Love OPI but Frozen in Time looks gorgeous - I love dusty shades like that. beautiful collection! Love all the colours featured here!! very unique! Taking Chances looks so pretty and unique! Actually just ordered Misa Breakway. These shots make me glad I did but also make me wish I had ordered more... Next time! All of these colors are amazing! I love Breakaway! Thanks for hosting another great giveaway! I'm crazy about the whole collection!! I love this entire collection. This are all gorgeous and unexpected for fall. Good job Misa! Beautiful swatches! I love Epiphany, and Taking Chances. Yayy another beautiful giveaway, as always your swatches are perfect Epiphany is so unique. Thank you for this opportunity :-) Live Without Knowing and Lost To The World are simply gorgeous. So many beautiful colours! I can`t choose who`s best for me. Thanks for the opportunity to win this Gorgeous collection! ... Live Without Knowing - love it!! Those colors are absolutely breath taking! I mean, wow! don't expect to win, but OMG (there's not more suitable phrase) I just can't stop staring at these photos, such an amazing colors! OMG ! what a wonderful collection !! I love all the colour of this collection. i can't choose one of all this nail polish ! I want all of them ! Frozen in time and Breakaway ROCK! I'm so very happy this is open internationally as its hard getting these awesome brands in Australia. Btw I love your pictures and how you label them etc, so professional. Frozen in Time is gorgeous! these are all so beautiful! thank you for having this giveaway! life without knowing is prettttty! I love live without knowing!!! I lovvve the light purple! I really love Taking Chances! frozen in time is beautiful! I NEED ALL of these colors!! This looks amazing! Will do my best to scout all over for this. I LOVE Live Without Knowing!! They look gorgeous! The colors in the pictures really seem to POP. I'm loving the Breakaway shade the best. I love frozen in time!